The three a cappella choral pieces that comprise "A Whitman Triptych" were composed between 2012 and 2014. "O Setting Sun" was commissioned by the Madison Chamber Choir, Madison, Wisconsin, Anthony Cao, conductor, and was premiered on April 20th, 2012. "What is the Grass" was composed for Cappella SF, Ragnar Bohlin, conductor, and is being premiered on tonight's concert. "Facing West" was commissioned in celebration of the 75th anniversary of the Golden Gate Bridge by the International Orange Chorale, Zane Fiala, conductor, and was premiered on May 27th, 2012. I first set Whitman to music in 1986,when I adapted part of "When Lilacs Last in the Dooryard Bloomed" as the basis for my composition "Invocation and Dance." I went on to set "Good-Bye, My Fancy" for Male Chorus and Soprano Saxophone in 1992, and "Song of the Open Road" for Mixed Chorus and Piano in 2004. Like so many composers, I have found the visionary quality of Whitman's verse inspiring; the vigor and intensity of the poetry seem naturally to draw out music. "What is the Grass?" is also an adaptation of a much longer poem, one of Whitman's deepest, and most mysterious. The poem begins as a child-like meditation on grass; as hope, as an embodiment of new life and new growth in the plant world. Then suddenly there is a somber turn with the line "And now it seems to me the beautiful uncut hair of graves." Here Whitman enters an extended mediation on how grass connects life and death, informed by his experiences in the Civil War. Hope returns with the line: "They are alive and well somewhere," leading to the mysterious final line: "And to die is different from what anyone supposed, and luckier..." Here Whitman affirms that death can be an initiation into a broader participation of existence. In the words of poet Ivan M. Granger, Whitman offers a "Zen-like riddle that doesn't offer an answer so much as a pathway of questioning." My musical setting follows Whitman's exploration, first taking a child's point of view, expressed with lilting melodies set in a lively compound meter. The entry of the tenor soloist indicates a change of mood to the serious. The first mood returns, leading to a climax on the words "And led forward life...", set in 9-part harmony. The mood turns reverent, as the tenor soloist intones: "All goes onward and outward; nothing collapses." The piece ends with a tone of gentle, slightly ironic questioning. -David Conte Duration: 5:42 . 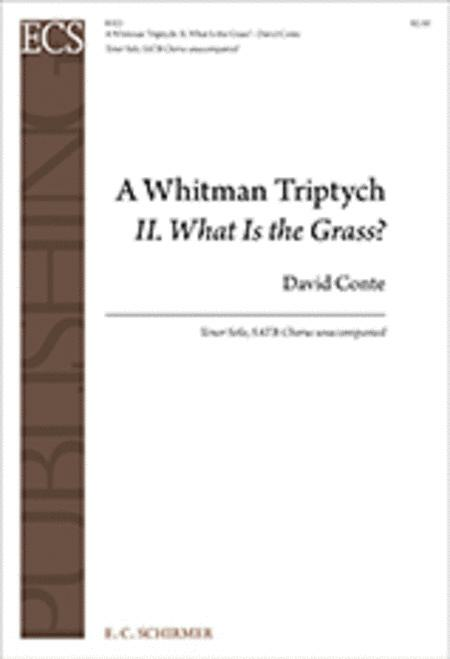 Preview: A Whitman Triptych: II. What Is the Grass?